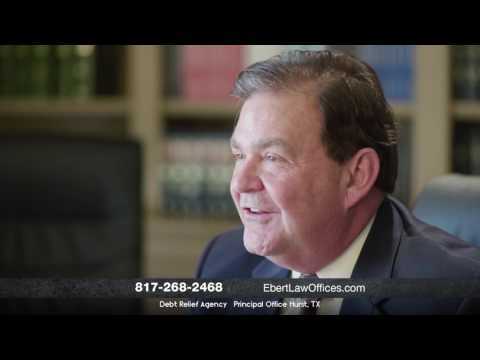 David Ebert regularly provides bankruptcy advice in a column entitled “Legally Speaking” that appears in the Fort Worth Star Telegram. Please note that materials in this website are provided for general informational purposes only and do not constitute legal advice, nor imply an attorney-client relationship. Disclaimer. What is the status of the proposed Bankruptcy laws? I’ve been struggling to pay my bills every month. What should I do if I am thinking about filing for bankruptcy? The Bankruptcy Bill did not pass during the 2002 session of Congress. However, with a Republican-controlled Congress, the likelihood of this legislation being reintroduced this year is great. This legislation will have an extreme impact on financially distressed debtors. Many of the rights consumers have under current law will not be available to them under the proposed bankruptcy laws. Under this legislation, consumers will be required to consult with a certified credit counselor before being allowed to file for bankruptcy; have to meet a stringent income test to qualify for bankruptcy; and certain debts that are currently discharged through bankruptcy will not be allowed to be discharged under any circumstances. DO NOT DELAY! It is very important to consult with an experienced bankruptcy attorney to determine what rights and options are available to you. If you are suffering financial hardship, owe the Internal Revenue Service or are experiencing difficulties, do not delay in consulting an attorney. How long will bankruptcy show up on my credit report? The filing of a Bankruptcy can appear on your Credit Report for up to 10 years after filing. However, we have been advised that the credit reporting agencies only keep the filing of a Chapter 13 on your credit report for seven years after the filing, or four years after the completion of the required minimum 36 months plan. While creditors are free to consider your filing for relief in deciding to extend new credit, new credit may be obtained after filing. The law provides that you cannot be denied a new home mortgage loan one year after a discharge if otherwise qualified. There are ways in which new credit may be established. The establishment of a savings account after your discharge is a positive factor that creditors will look at in making their decision on whether or not to extend new credit. Creditors also look at the fact that after your discharge you do not have any unsecured creditors and that you are not eligible to file another Chapter 7 for six years. If you file a Chapter 13 and pay 70% of your unsecured debt through the Chapter 13 plan the Trustee has a program which will assist you in establishing new credit. At this time there are approximately 125 creditors who have agreed to participate in this program. What should I do now if I think that Bankruptcy may be in my future? Very few people are in a position to file a Chapter 7 when they first come into our office. Once a bankruptcy petition is filed many things happen immediately. The bankruptcy estate is created with all of the the assets you own or are entitled to at that moment. You cannot go back to correct anything that was not intended, therefore careful planning is usually required to avoid any unintended consequence. There are things that can be accomplished prior to filing to preserve as much of an estate as possible. You may be able to transfer non-exempt assets into certain exempt assets. There are certain rules that must be followed in preserving your estate. Self-help in doing this is rarely successful, generally destructive and may cause objections to be filed in your obtaining a discharge. If you believe bankruptcy is the correct option for you then you should seek out a competent bankruptcy attorney to guide and assist your planning and preparation to filing. I’m worried because my husband is in the Army Reserve and may be called up for service. His income will be significantly less without his full-time job. What will happen if we can’t keep paying all our bills? If you are worried about paying your bills you should consult with an attorney to find out what bankruptcy and non-bankruptcy options are available to you. Don’t wait until you have fallen so far behind on your bills that your options are limited and your property may be in jeopardy. If you are having a temporary loss in income or a long-term reduction in income, you may qualify for a Chapter 13 Wage Earner Plan that allows you to reorganize your debts based on your ability to repay. If your husband’s income is going to be seriously affected by his military service and you cannot make any payments on your credit card bills you may qualify for a Chapter 7 Bankruptcy. If you are experiencing financial difficulties due to changes in your employment or you have been called to active military duty, and you think bankruptcy may be a solution, you should seek out a competent bankruptcy attorney to guide and assist you in your planning and preparation to file. I have not paid my income tax returns for the past several years and I know I owe the IRS a large sum of money. I’m worried about what happens when I file all these returns. What should I do? WARNING! The House has passed bankruptcy reform legislation and the Senate has not yet taken up the bill. However, your options are becoming more limited. Under the new legislation, no income tax debts will be able to be discharged in bankruptcy no matter how old the tax debt. According to the legislation, these new laws are to take effect 180 days after the President signs the bill. Six months from now you will not be able to discharge the taxes you may owe the IRS. Many of the rights consumers have under current law will no longer be available to them under the new bankruptcy laws. Under the new legislation, consumers will be required to consult with a certified credit counselor before being allowed to file for relief; have to meet a stringent income test to qualify for bankruptcy, and certain debts that are currently discharged in bankruptcy will not be allowed to be discharged under any circumstances. DO NOT DELAY! Please consult with an experienced bankruptcy attorney immediately to determine what rights and options are available to you. If you owe the Internal Revenue Service do not delay in consulting an attorney before this creditor-friendly bill takes effect. I’m worried about being laid off from my job. What will happen if I can’t keep paying all my bills? Will I lose my house and car? Some of my friends are borrowing against their 401(k). Should I do this too? If you are concerned about paying your bills, talk with an attorney about your options. You may be able to reorganize your debt and retain your property without having to borrow more money. When you borrow money from your 401(k) it can create tax problems, specifically if you end up losing your job and cannot repay the loan. Following the advice of friends may cause you more problems that cannot readily be remedied by an attorney. You may have several options available to you, including bankruptcy and non-bankruptcy solutions. Don’t wait until you are so far behind on payments that your options may be limited. Borrowing money from property you can claim as exempt like your 401(k) to pay your bills may be a temporary solution. However, if you still have bills that are not paid off after you borrow the money, you still have payments to those creditors plus your new 401(k) loan. Ultimately, robbing Peter to pay Paul is not a wise decision. If you are experiencing financial difficulties due to economic downturn or a lay-off, you should seek out a competent attorney to guide and assist you in your planning. I own a business with another person. If I declare bankruptcy will this affect my partner? This depends on the type of business arrangement you have with the person you are doing business with. If you are incorporated and you file a Chapter 7, your stock in the corporation may not be exempt and you may be required to turn it over to the Trustee who then will become a stockholder in the corporation. The Trustee may sell the stock if someone can be found to purchase it. Neither the other stockholder nor the corporation will be responsible for your liabilities. If you are in a general partnership it can be quite involved and complicated. Partners are jointly and severally personally liable for all debts and obligations of the partnership. Creditors may look to any partner for the payment of the firm debts. If one general partner files for Chapter 7 relief it could cause dissolution of the partnership and could force the remaining partner into bankruptcy if the means to satisfy the business creditors is not available. All proceedings involving a business and bankruptcy are very complex and attorneys who are experienced in this field should be engaged for advice and planning. In a Chapter 13 you will be able to retain your interest in the business if you meet the Chapter 13 requirements. Neither the business nor your co-owner should be affected by your Chapter 13 filing as long as the business continues to meet its obligations and only your personal debts are included in the plan. I’m worried because my company is talking about cutting our overtime hours. I depend on this money to help pay my credit card bills. What will happen if I can’t keep paying all my bills? I’m thinking about taking out a home equity loan to pay my bills. Is this a good idea? Borrowing money from the equity in your home can be a solution. If you pay off your credit card bills and lower your monthly payments by refinancing your home or by taking out a home equity loan, this could be a solution. However, most people do not have the discipline to stop using their credit cards and, before they know it they have more credit card bills and a big second lien on their house. Now the house is at risk of foreclosure because of credit card debts. Ultimately, robbing Peter to pay Paul is not a wise decision. If you are having problems paying your bills, seek legal advice to find out what options are available to you. You may qualify for a Chapter 13 Wage Earner Plan that allows you to reorganize your debts based on your ability to repay, or, you cannot make any payments on your credit card bills, you may qualify for a Chapter 7 Bankruptcy. If you are experiencing financial difficulties due to economic downturn or layoff you should seek out a competent attorney to guide and assist you in your planning and preparation to file. I took out a home equity loan to get out of my financial problems from too much credit card debt. Now I am having problems making the payments and I am worried that I could lose my house. What can I do to protect my home? If you are behind on your home equity loan payments, Chapter 13 reorganization may help you catch up your payments and possibly save your home. Lenders are subject to strict guidelines related to home equity loans. Unlike the mortgage company that loaned you the money to buy your house, a home equity lender cannot foreclose your house without going to court. The Texas Constitution has a long list of requirements that your loan must have met and the lender must have complied with for it to be a valid home equity loan. The Bankruptcy Court can determine whether or not a valid lien exists and how much you may have to pay the Lender. If you are unsure about whether or not your lender has complied with all the rules, you should consult with an attorney to allow them to review your loan documents. If you have any questions about alternatives available to you under the Bankruptcy Code, please call our office at 817-268-2468, or visit us on the Web at www.ftworthbankruptcy.com. My wife has her own money. Will my bankruptcy affect her money? If your wife files a joint petition with you all of her assets will be part of the bankruptcy estate. If your wife does not file with you and the debts are all your debts, incurred prior to your marriage, then her separate property will not be part of your bankruptcy estate. To be separate property it must have been hers prior to your marriage or received by a gift or inheritance after your marriage. Additionally she must have not co-mingled this property with any of your joint community property. Once the property has been co-mingled then it becomes community property and all community property becomes part of the bankruptcy estate. If your wife does not file with you and all of the debts listed in the petition have been incurred after your marriage (community debts), then your wife is also responsible for these debts and the creditors could attempt to collect from your wife’s separate property after your discharge. If you believe bankruptcy is the correct option for you then you should seek out a competent bankruptcy attorney to guide and assist you in your planning and preparation to filing. I have seen a series of television commercials that claim under Federal Law I can force my creditors to accept consolidation of my bills into one low monthly payment. Is this possible? These type of ads refer to Chapter 13 bankruptcies. Whether your debt dilemma is the result of an illness, unemployment or overspending, it can seem overwhelming. In your effort to get solvent, be on alert for advertisements that offer seemingly quick fixes. While the ads pitch the promise of debt relief, they rarely say relief may be spelled b-a-n-k-r-u-p-t-c-y. The Attorney-Client relationship is based upon trust. Be wary of misleading solicitations from Attorneys before selecting your counsel. We have a home which we can no longer afford. Can we give it back to the mortgage company without any further obligation? If you do not continue to make your mortgage payment, the mortgage company will eventually foreclose. A foreclosure is a sale of your property at a public auction on the first Tuesday of the month. The mortgage company does not have an obligation to sell your home for fair value, or even the outstanding loan balance. If your house is not sold for an amount sufficient to fully pay the outstanding loan balance plus expenses of sale, you remain liable for any difference. If the mortgage company does forgive the debt, the IRS can determine the forgiveness is taxable income (Debt Forgiveness income). The Bankruptcy Code may give you the relief you desire. In bankruptcy you can surrender the property and discharge any post-sale deficiency, thereby avoiding tax consequences. Alternately, if you are delinquent on your mortgage, but want to keep your home, the Bankruptcy Code may also help you save your home and cure your missed payments. I lost my job several months ago. I found another job at 30% less income. Now I have difficulty paying all my credit card debts and am considering whether Credit Counseling or Bankruptcy is a better alternative? It is wise to learn about available options before you make any financial decision. On April 9, 2003 the National Consumer Law Center and the Consumer Federation of America released a comprehensive report on the credit counseling industry. The report focuses on the threat to consumers from a new generation of credit counseling agencies. The report found these new agencies often harm debtors with improper advice, deceptive practices, excessive fees and abuse of their non-profit status. Many consumers can benefit from honest credit counseling, but only those who can afford to pay off all of their unsecured debt should be enrolled in these plans. Otherwise you will be wasting sparse resources trying to stay on payment plans that will become unworkable. Unlike consumer counseling, a reorganization bankruptcy does not always require the repayment of 100% of credit card debt. Under certain conditions, the law provides that a consumer’s best efforts for a period of three years are sufficient to earn a fresh start. If you are interested in learning if bankruptcy is a viable alternative for you, please contact our office at 817-268-2468, or visit on the Web at www.ftworthbankruptcy.com. I have been told that filing for protection under the Bankruptcy Code is a ten (10) year mistake. If I file, will I be able to establish new credit or be able to obtain a mortgage loan? The effect of a bankruptcy on your credit depends on your status at the time you file for bankruptcy protection. Typically, when clients hire our firm to represent them in bankruptcy, their credit is already damaged. Even though the bankruptcy will appear on your credit history, the extent of the damage varies by client and circumstances. The filing of a bankruptcy can improve your ability to obtain credit. After filing bankruptcy, you are no longer obligated to pay the debts discharged in the bankruptcy. Often, this freedom from debt yields disposable income. Since the law prevents you from filing a second Chapter 7 bankruptcy within eight (8) years and you now have disposable income, you may be credit worthy. From a creditor’s perspective, because the risk of default has decreased, they may be more likely to extend credit to you after bankruptcy than before you filed. As you can see, your ability to obtain credit depends upon your income and circumstances.It is not impossible to secure credit or obtain a home mortgage. I have worked for the same company for 10 years. Due to the economy, everyone in the company is being forced to accept a pay cut. I will lose 25% of my income and all overtime. Without these funds I won’t be able to continue to pay everything. What can I do? Prioritize your financial obligations. Debts fall into the following categories: debts you pay to survive, debts that enable you to earn a living, and debts that are not essential for your survival or ability to work. Pay all debts necessary for survival first. Pay debts that enable you to work next. Only with funds remaining do you address the third category of obligations. If you don’t have enough money to satisfy all your obligations, you may find relief through a reorganization of debt (a Chapter 13) or through straight relief (a Chapter 7). A Chapter 13 is useful if you have been unable to keep your house or vehicle payments current, or have tax problems. A Chapter 13 requires you to dedicate any income you have remaining after paying living expenses to the repayment of debt. A Chapter 7 relieves certain debt obligations at the risk of losing non-essential or luxury items. Both Chapter 13 and Chapter 7 are options to keep you and your family afloat during these difficult financial times. Do I have to list all my creditors in my Bankruptcy? Am I prohibited from paying some of my creditors myself? All your creditors must be listed in your bankruptcy petition under penalty of perjury. The failure to answer all of the questions fully and truthfully including the listing of all your creditors can result in not only your discharge being denied but also being found guilty of a bankruptcy crime for which there is a penalty of a fine of not more than $5,000, or imprisonment of not more than 5 years. An attorney who knowingly withholds such information may also be found guilty of the same crime and subject to the same sanction. You may reaffirm any debt you desire by filing a reaffirmation agreement with the court. This agreement puts you in the same position you were with this creditor prior to your filing. This means if you fail to pay the creditor according to the terms of the agreement, the collector may take collection actions against you including the filing of suit. You may also pay any creditor after you discharge that you desire. This is a voluntary repayment and the creditor does not have the right to take collection actions of file suit if payments are not made. We have never known a creditor who has refused a voluntary repayment.